Following the long distance classic yesterday, today (Thursday) it was the turn of the 'short' distance athletes to take on the Alpe d'Huez Triathlon. The 1.2km / 30km / 7km course doesn't sound too difficult, but when a European Age Group Champion, Matt Molloy, tells you after the race "that was tougher than a half (ironman)", then you start to see that this is still a worthy - but slightly more achievable - challenge. Indeed, around 1200 athletes took to the cool but stunning surrounds of Lake Verney, many of whom had travelled from the UK. No motorbike for me today, but I did get to watch most of the race up the climb of Alpe d'Huez, which essentially is why almost everyone was here anyway! Spaniard Francesc Godoy was the first to reach turn #21 - the first on the climb from Borg d'Oisans - as each hairpin is numbered in descending order until you reach the summit. 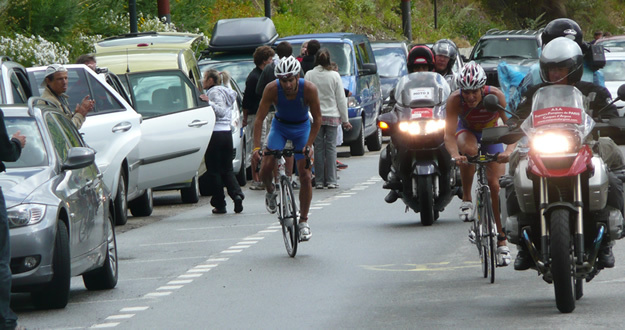 The French based British Shaw brothers were well up the field in the top six, but missing in action was race #1, Marcel Zamora Perez, the five-time winner of Ironman France. Known for his stunning run speed, the deficit was looking like even he would not make an impression at this stage. Godoy was joined on the climb by late entrant from Italy, Alberto Casadei, and the pair were locked together through most of the ascent. Casadei headed out onto the run course at around 1800m altitude just a few strides ahead of Godoy, with Australian David Dellow 1:45 back. And that was how it remained to the finish. An ecstatic Casadei crossed the line clutching a Marco Pantani bandana, pointing to the sky in honour of the Italian cycling legend, and Tour stage winner here in 1995 and 1997. French based athlete Karl Shaw was first Brit across the line in fourth. Like the men, the ladies finishing positions mirrored the exit of T2. 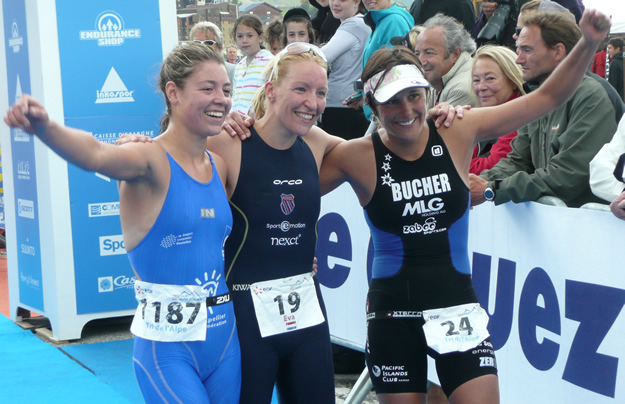 Eva Janssen (NED) defended her 2009 win, ahead of top XTERRA athlete Renata Bucher (SUI), with GB's double World Junior Duathlon Champion Sophie Coleman in third place. Sophie only entered on Monday, and thoroughly enjoyed the race, despite claiming to be "not that fit" at the moment. This is certainly a very popular international race, and it is interesting to note that not one French athlete made the podium. If you are looking for a tough, but achievable challenge in 2011, then the Alpe d'Huez Short Course race should be on your 'to do' list. Easy transport from the UK and, being off-season in this ski resort, plenty of reasonably priced accommodation is available, or indeed camping options should you so choose.